I... rock. That pun is only funny (or not) if you speak German though. A skirt! Look! A skirt! And, excitingly, I made it myself. And it does not even look like I did! Because, you see, I feared that it would come out as something shapeless and sacklike that I'd only wear once or twice, somewhere not-too-public, because I wouldn't want to admit that even though I put quite a bit of time (and cursing and throwing into corners and despairing and starting over) into it, it had been a complete waste of time and sparkly tweed. But (even though it is a tiny bit too loose on me and if I feel patient and motivated enough, I'll fix that later) it looks nice. So I'm remarkably proud of it now! 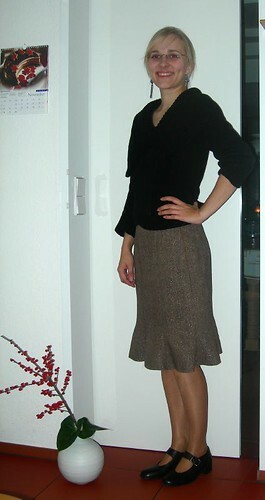 There are even plans already to reuse the pattern (a Burda easy fashion pattern, by the way) in another color.